A journalist has claimed Arsenal legend Arsene Wenger wanted Napoli boss Carlo Ancelotti to be his replacement at the Emirates Stadium instead of Unai Emery. The French tactician stepped down from his position with the Gunners at the end of last season, bringing to an end a 22-year association with the club. Emery was appointed as Arsenal’s new manager shortly afterwards, and has endured a mixed campaign in his first year in north London. The Spanish tactician impressed with some fine work at Sevilla and Paris Saint-Germain, but the jury is still out on whether he’ll cut it in the Premier League. 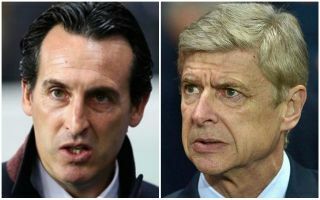 Emery’s Arsenal take on Ancelotti’s Napoli in the Europa League next, but Ciro Venerato has been quoted by the Metro as claiming the Italian tactician could well have ended up in the Emirates dugout if Wenger had got his way over his preferred successor. Ancelotti has a wealth of experience and a long list of major honours from his time at some of Europe’s biggest clubs, but it remains to be seen if he could really have enjoyed the same amount of success with the kind of resources he’d have to work with at Arsenal. ‘I’ll tell you a behind-the scenes story dating back to last summer when Arsene Wenger indicated Carlo Ancelotti as his possible heir and successor on the Arsenal bench,’ Venerato told TV Luna’s ‘Goal Show’, as translated by the Metro.